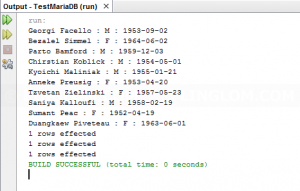 From Part 2, I have established a connection to employees database on MariaDB. Now, I’ll show how to retrieve and modify data from the database. To get data, I send query to MariaDB server and get result back. 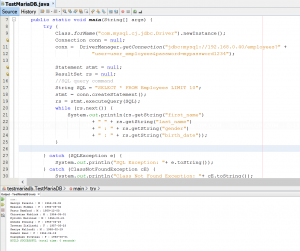 First, I create stmt (Statement object) and execute SQL query. Then I store the result on ResultSet object and iterative show the result on output window. Line 18: creates a Statement object for sending SQL queries to the database. 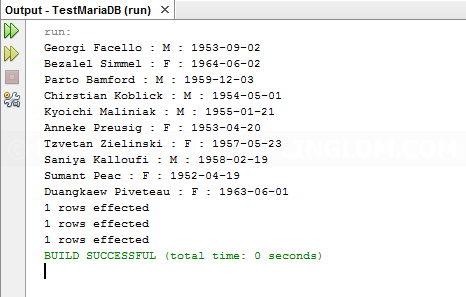 Line 20-25, in while-loop, iterative in the ResultSet object to show result in console (first_name, last_name, gender, and birth_date columns in Employees table) on output window. Sample result will be similar to the below figure. Note: I have limit only first 10 records from the table. To insert a new record, you can use the code above and simply change SQL command, modify some code a little bit. String strSQL = "INSERT INTO Employees (emp_no, first_name, "
+ "last_name, gender, birth_date, hire_date) VALUES "
Update and delete record code are the same with insert, only change in SQL statement. String strSQLUpdate = "UPDATE Employees SET first_name = 'Jack'"
You can download source code example at TestMariaDB.java (right-click the link and select Save target As). But you have to change connection string to match your environment. 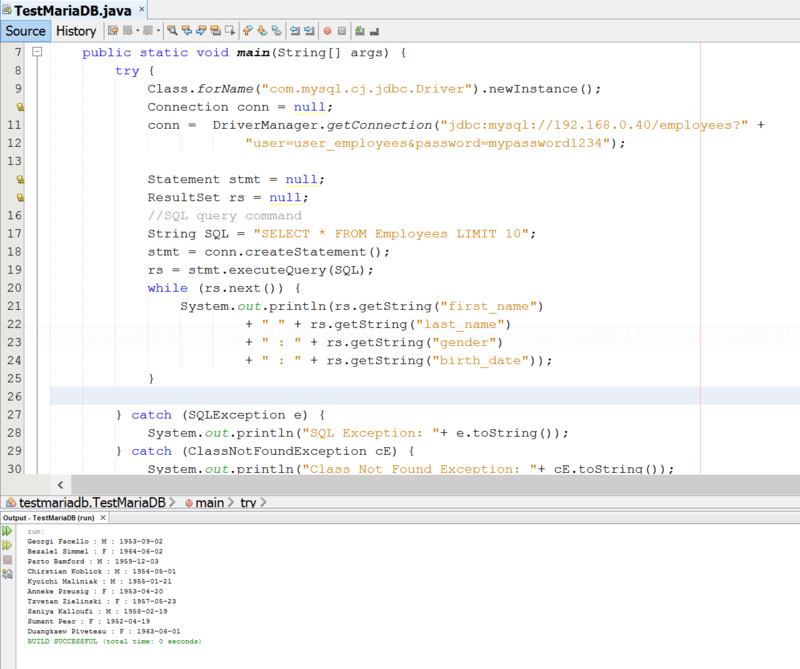 The example code will connect to Employess database and try to retrieve records, insert a new record, update the record and delete the record from Employees table. The result is below.